A garage door opener is a complex motorized device, and over the course of its working life it can easily develop some issues. With the help of our expert technicians you'll be able to prevent breakdowns and accidents, which will save you time, money and inconvenience. There are three distinct types of garage door openers on the market today, and each one is best suited to different uses. Chain drive units are reliable and affordable, and are most commonly installed when owners aren’t worried about noisy operation. Belt-drive openers are perfect for keeping noise to a minimal level, although they’re more expensive than the other types. Screw drive models are ideal for owners that don't want to deal with maintenance, since they require very little attention. They do operate quite noisily, though, so you should take that into consideration. Different manufacturers offer special features and upgrades for their opener models. Some systems come with WiFi connectivity, allowing your system to integrate with smart home technology. A lot of openers can also feature backup battery systems, which can come in handy during power outages. Some manufacturers such as LiftMaster and Genie offer additional security in the form of rolling code technology. This feature changes the remote control access codes every time you use it, which prevents thieves from using it if they are able to hijack it via technological means. 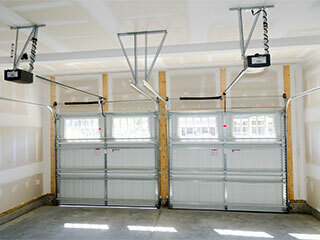 Regular maintenance is the only way to ensure your garage door opener remains fault-free throughout its service life. Our technicians will thoroughly check each component, from the motor gear and circuit board to the rail and the trolley, noting any areas of wear or corrosion and addressing them right away. Any damaged parts will be repaired on the spot or, if necessary, replaced. As part of our regular maintenance service, our team will also tests your door’s safety systems, checking the alignment of the photo-electric eyes to ensure that if anything gets in the door's path the system won't close it. Our technicians at Garage Door Repair Boynton Beach are always ready to help. Whether you need to have a new opener installed, professional maintenance services or emergency repairs, we'll be there to take care of it. Call us today for more information. We are a team of professional service technicians that specialize in repairing and installing automatic garage door systems. We have a great deal of experience, and after working in this industry for so many years, we are now capable of providing an effective solution to any type of problem a customer may experience. Check out the rest of our website to learn more about us. Thank you for choosing Garage Door Repair Boynton Beach! One of our experts will be in touch soon. Feel free to browse our website for FAQ, tips and more useful information in the meantime!